Not all filters are alike. The Bio Cart by Air-Care manufactures its own HEPA filters so you can rest assured that every HEPA filter is certified unlike others. In addition to the HEPA and its electrostatic pre-filter, the Bio Cart has two UVC/UVGI, germicidal lamps in HEPA air scrubber to kill bacteria, mold and viruses captured in the HEPA filter. The ultraviolet-C (UVC/UVGI) wavelength (254nm) was promoted in the mid-1990s primarily to improve indoor air quality by preventing microbial buildup on HVAC cooling coils, air filters, and duct surfaces, and in drain pans. These lights are ideal for all purposes and there is a window to illuminate the floor inside the cart and provide positive indication that they are operational. The built in Air Scrubber has an 880 CFM, backward inclined fan with variable speed control to provide full air flow at a low sound levels. HEPA filtration for the built in Air Scrubber has Electrostatic and Carbon pre-filters to collect debris and odors ahead of the 99.97% HEPA filter to extend the life of the HEPA. HEPA filtered air exhausts out the bottom of the Bio Cart to prevent air from blowing papers off desks or disturbing curtains around hospital beds. 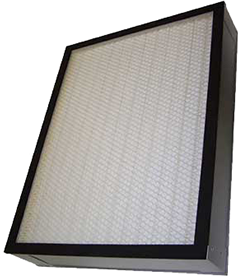 The HEPA filter is accessed though an external door for simplicity of replacement. An interlock on the HEPA replacement door turns off the UVGI lamps and blower when the door is opened.